A passport consent form is a document which is intended to prove that an individual is legally permitted to obtain a passport and travel. The form is mostly used by government and travel agencies, specifically for minors or children and people who may need additional assistance when doing particular tasks. 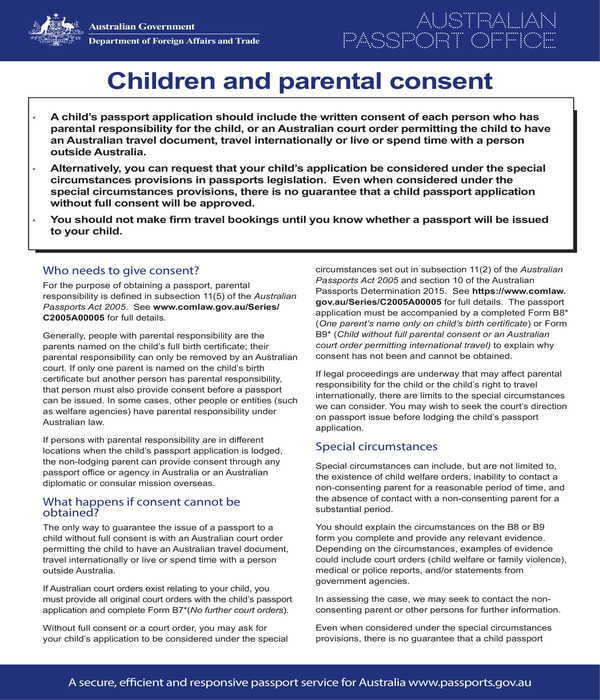 Passport Application Letter of Consent Form – This type of passport consent form is to be used by parents or legal guardians of children who will be submitting a passport application. The format of the form is identical to a formal letter which contains the entry date or the date when the letter was used, the name of the agency who required the consent in the first section. On the other hand, the body of the form is where the names of the parties involved in the application such as the name of the parent and the child, along with the child’s date of birth and gender. And in order to complete the form, the parent must affix his signature, address, and telephone number in the allotted areas. Passport Children and Parental Consent Instructions Form – This form is not to be filled out by the passport applicant rather should be read in order to have a guide towards the process of passport application and in the necessities of having the parental consent signed. A set of questions are indicated in the form which centers on helping the applicant in knowing who are allowed to grant consent, the special considerations, and circumstances where parental consent can be waived, the processing times of the consent, and the contact information of the State agency who will handle consent-related concerns and issues. 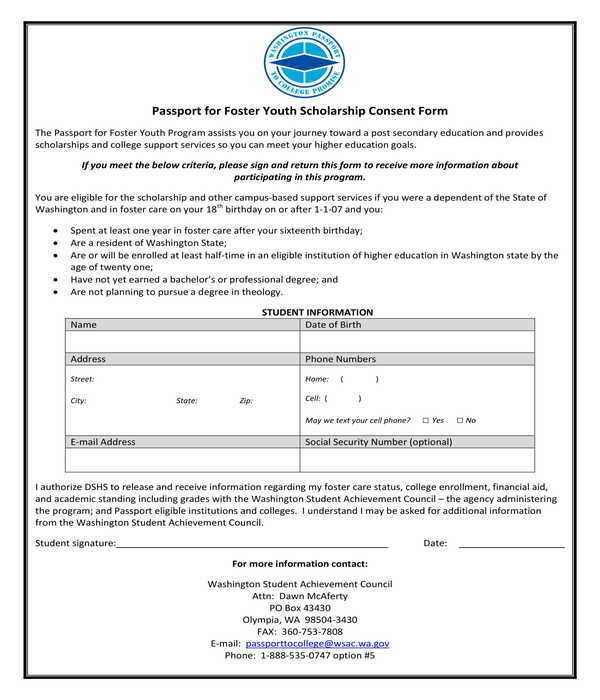 Passport for Foster Youth Scholarship Consent Form – Compared to the aforementioned form types, this document is not intended for consenting a minor or youth to travel, rather apply for a scholarship program. The form contains four sections and in the first section, the applicant will be able to know about the eligibility requirements of the program that he must meet. The second section is where the applicant’s general information will be disclosed while the third section is for the applicant’s authorization. In addition, the last section of the form is allotted for the mailing address and contact details of the organization who promotes the scholarship program. 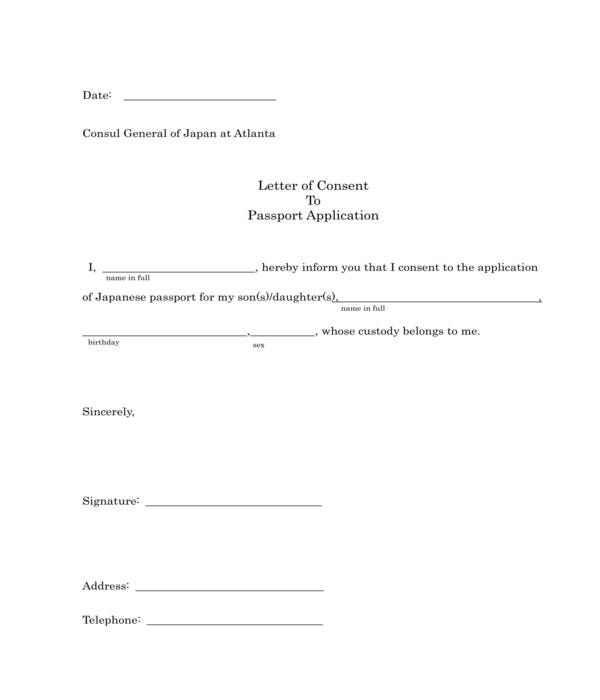 Passport Immigration Parental Consent Form – This form is specifically for immigration or travel purposes and can be used for several minor or child passport applicants. The form should be filled out by the parent of the applicants. The information to be collected in the form includes the name and address of the parent as well as his telephone number, identification number, the names and dates of the births of his children, and his signature. Step 1: Add the agency’s or the organization’s letterhead. In the letterhead, the organization’s name and logo will be indicated along with the name of the State or country where the organization is located. The title of the form which is “Parental Passport Consent Form” should be placed and emphasized below the letterhead as well. Step 2: Make a section for the parent’s or the legal guardian’s basic data. Documenting the basic data of the applicant’s parent is important to properly record the parent’s identification and to legally acknowledge who is responsible for consenting the applicant. The data to be collected should be the parent’s name, address, phone numbers, and email address. Step 3: Allocate a section for the child’s information. The name of the child applicant and his date and place of birth should be disclosed in this section of the form. Additionally, boxes or blocks can also be placed into this section which is suitable for parents or the legal guardian who will be consenting more than one child to obtain a passport. However, each box should be able to collect the necessary particulars of each child, as well as their relationship to the guardian or individual who will grant the consent. Step 4: Include an area for the child’s passport application information. This is the section where the name of the adult accompanying the child and the child’s passport number, issue date, and place will be specified. The purpose of this section is to aid the agency in searching and verifying the information of the involved parties or the parent and the child. Step 5: Incorporate an authorization statement and a signature block. The authorization statement should indicate the approval of the parent to the child’s passport application. Accompanying the statement would be the signature block for the parent’s signature and the date when the consent was signed. What should be submitted along with the signed passport consent form? Every State and country will have their own passport application requirements, however, the most common documents to submit along with the signed consent would be the photocopy of the parent’s or the signer’s passport and identification cards. These documents will be for validating and verifying the claims of the parent’s eligibility in granting the consent and of his relationship to the child or minor. 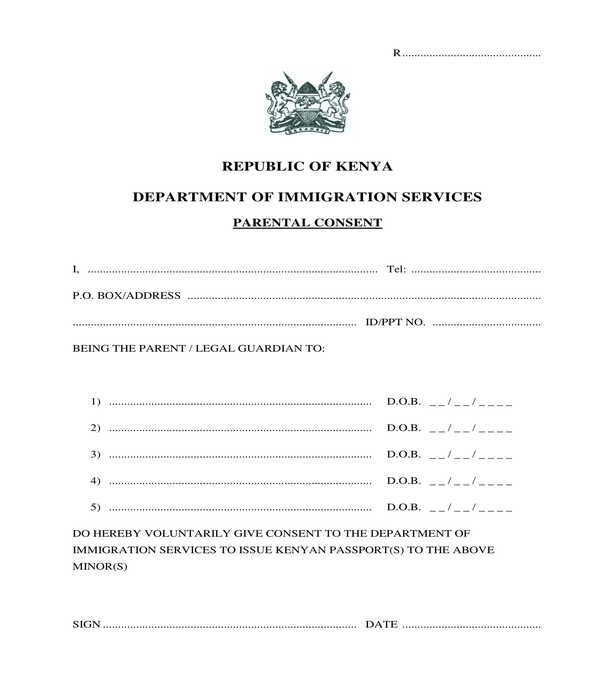 Who should sign the passport consent form if neither parents are not present? 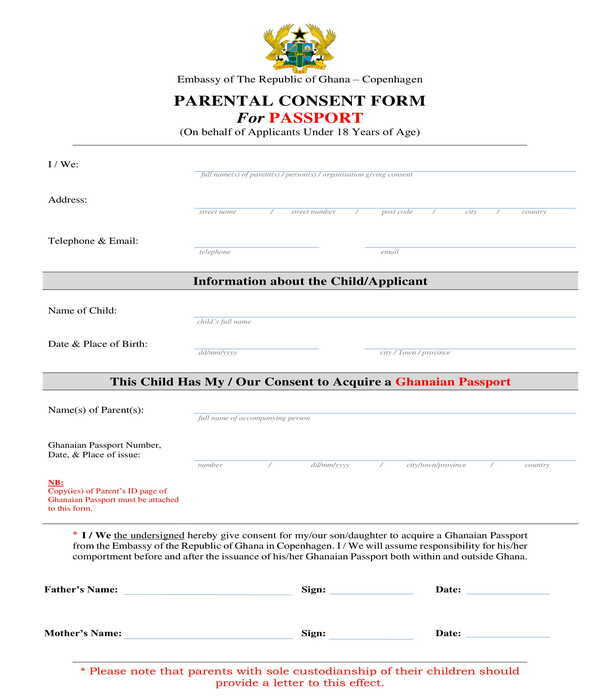 A legal guardian who has been appointed and authorized by the parents can sign the consent. But, the parents should provide a passport application joint sworn affidavit in order for the legal guardian to be acknowledged by the passport and travel agency of the State. Our passport consent form templates help organizations and agencies to use lesser time in making the consent form rather than drafting one from scratch. To use our form, the organization’s document -preparer must first identify and choose which consent form will be needed by the organization. Identifying the form requires the document-preparer to know the type and preferences of the organization in lieu of the paperwork and documents which are and will be used. Then, the document-preparer should click on the “download” button which is located beside the image of the passport consent form and below the specifications of the form. The file that the document-preparer will download is in a .zip file or the compressed form. In order to acquire the form, extraction must be conducted. After extracting the file, the document-preparer can then open the file and alter or incorporate changes into the form to fit the organization’s needs.